Growing up as a kid in the 1950’s in a little community know as Jennings, MO., I can still picture the 2-story house my dad built, and the peach tree planted right along the south side of the house. My dad loved to make flower gardens and he especially loved rose bushes. But, he really loved that peach tree. One year, when I was about 12 years old, that peach tree grew so many huge peaches that its branches were bent over almost to the ground. My mom decided that she should make the best of the peaches, and so one day she bought a ton of canning jars. Yes sir! She would put up peaches and we could savor them all winter long. My job was to peel the peaches after she blanched them in a gigantic pot of boiling water. I will never forget this “learning experience.” After hours of complaining that my fingers would fall off, and that I had a headache, and that I was itching all over from peach fuzz, and that I didn’t care if I ever tasted another peach again; the job mercifully came to an end. Days later, when all the jars were lined up on her shelf, she decided it was time for a peach cobbler. I can still remember that smell hitting me when I came home from playing with my friends. The oven was on and the cobbler was just about to come out. The air wafted with smells of cinnamon, sugar, and peaches gently seething under a sheet of pie crust. Supper couldn’t have come sooner that night. Mom didn’t have to tell me to clean up and help her get the food on the table; I was so willing. I even ate the peas on my plate, because I knew that dessert was going to be worth it. Just one bite of that cobbler forever sealed the memory of the peach tree. 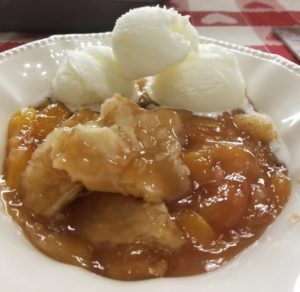 Thinking about the hard work was still a mind sore, but I have to say from that time to this, I have never stopped making peach cobblers. Get the recipe from my Rosalie Serving Country cookbook, page 187. You just don’t know how happy you will be!